This kaolin clay facial cleanser helps remove toxins, dirt, and makeup from your skin. The clay and the oil both work to dissolve oil, so it can help improve our complexion. Unlike other cleansers that exfoliate, this cleanser won't cause redness or irritation. This makes it great to use for sensitive skin. 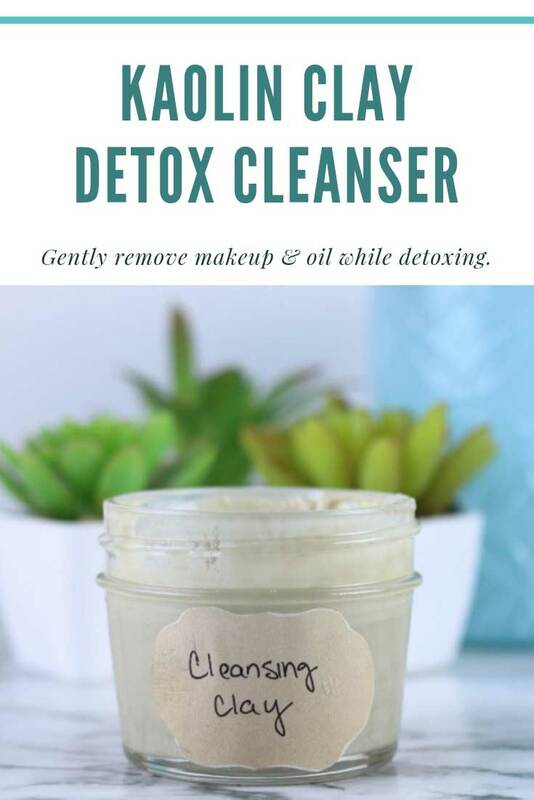 Over time, this natural facial cleanser can balance oil production and tighten and tone the skin. 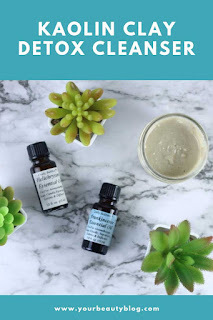 Kaolin clay is the most gentle clay, so that's why I use it in this cleanser. Since it's so gentle, you can use this daily if you want. I generally use it every two to three days because I'm using Derma E Anti-Wrinkle Vitamin A Glycolic Cleanser With Papaya the rest of the time. Kaolin clay is silica based, and it absorbs oils and detoxes the skin by removing toxins. It also has minerals in it to nourish the skin. With repeated use, you may notice that fine lines aren't as deep and wrinkles are less pronounced. Kaolin is a great clay for sensitive skin. I have oily skin, but it is somewhat sensitive. Kaolin doesn't leave my face red after I use it. This clay also naturally exfoliates your skin. When you exfoliate regularly, your skin looks brighter and feels softer. Some exfoliators irritate my skin, but kaolin is gentle on the skin. Some clays are drying, so you can't use them every day. I have oily skin and can only use bentonite every week or every 10 days. Kaolin clay isn't drying. Instead, it leaves your skin toned and soft to the touch. Kaolin clay can boost circulation to your skin, which over time can help tone and tighten the skin. Couple that with using a circular motion to massage your skin while you wash, and you get double the benefits. You'll have to use kaolin clay for several weeks or months to really see the benefits of it. Some ingredients work pretty fast, but this isn't one of them. I recommend buying your clay from a reputable source. I recommend Frontier brand kaolin clay because it's a trusted brand that I've used often. Apricot oil is also called apricot kernel oil. It comes from the kernel or seed of the apricot. I chose it because it's a very light oil, and it absorbs into the skin quickly. I don't want to feel greasy after I use it, so I used it in a higher concentration in this recipe than I did the castor oil. Apricot oil is mainly made up of unsaturated fatty acids, including oleic acid and linoleic acid. It also has vitamins A, C, E, and K to benefit your skin. It's a great oil for firming and toning the skin. It can help reduce the signs of aging and dark circles on your skin. It's also an excellent moisturizer for your skin. Castor oil is probably more commonly used for treating GI problems, but it's an excellent carrier oil for your skin. It's a rich oil that's high in fatty acids to smooth your skin and make it softer. Since apricot oil is a dry oil, this richer oil complements it well. By combining the oils, you can the benefits of both without leaving your skin too oily. Castor oil is naturally antimicrobial, so it can help reduce acne. It is also anti-inflammatory if you do have some blemishes. Castor oil is also said to promote skin cell regeneration, so it can help balance an uneven skin tone. 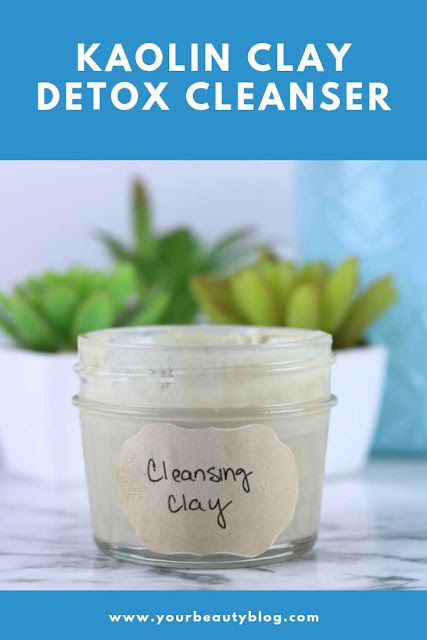 I used frankincense and helichrysum essential oils in my DIY kaolin clay facial cleanser recipe. Admittedly, they don't smell the best, but they do work really well on my skin. Frankincense essential oil is a natural antiseptic, so it can help reduce blemishes. It is also an excellent oil for tightening and toning the skin. It can help lift and tighten the skin for a firmer look. It is said to reduce the appearance of scars, including acne scars, and heal the skin. Helichrysum essential oil is a really gentle oil, so I like to use it in skin care. It's also antimicrobial and anti-inflammatory, so it's a great oil to use if you are prone to acne. Combine clay and oils in a mason jar. Add the essential oils and stir well. I mixed it right in the jar and didn't have any trouble mixing it, but it was a tight fit. You can also mix it in a bowl and transfer it to a jar. To use, scoop out about a tablespoon on your fingers and use a circular motion to gently cleanse your skin. Avoid the eye area. Rinse well. You can also spread this on your face and let dry for 10 to 15 minutes. Wet the mask and use your fingers to gently massage the clay and oils to cleanse your skin. Rinse well. Wasn't that easy? 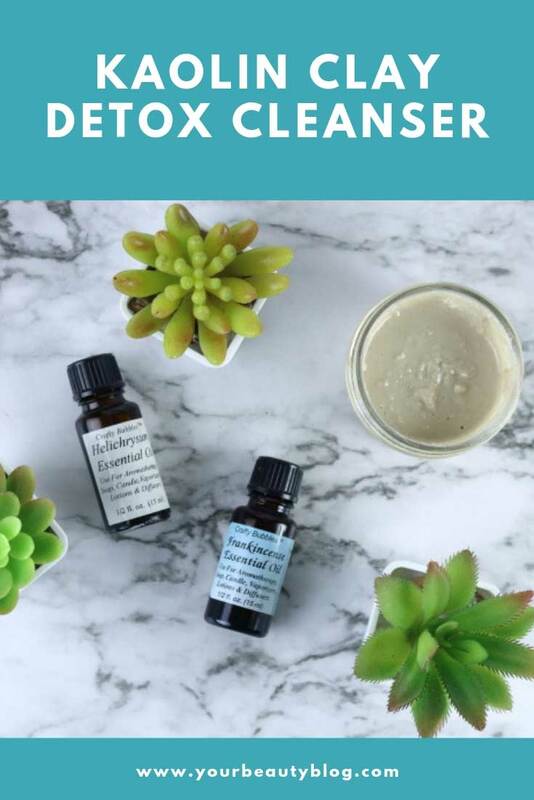 That's why I love this DIY kaolin clay facial cleanser recipe; you just need a few ingredients, and you can even choose your favorite carrier oils and essential oils. Bonus: you don't even dirty anything more than the spoon you use to stir it with. I made my own labels from a set of graphics I bought on Etsy. I bought these cute kraft paper labels and put several of them on a paper and printed on sticky paper. That way, I have labels ready when I need them. You can also find blank labels to buy or to print yourself. Combine clay and oils in a mason jar.